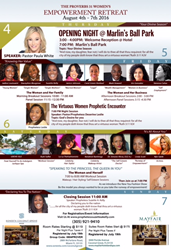 Pastor Paula White heads the “Proverbs 31 Women Empowerment Retreat” along with other powerful keynote speakers, Aug. 4-7, 2016. The retreat is geared towards preparing women of all ages to survive their “wilderness experience” and providing them with the tools to living a stress-free and virtuous life, while walking in God’s divine purpose and plan. Know that God can speak one word. That one word will not only change your circumstances, but will indeed change life as you know it. To the point where you can never go back to being whom you once were. Sarahi House of Fashion and Prophetess Suzette A. Kelly are proud to present the first annual “Proverbs 31 Women Empowerment Retreat,” Aug. 4, 5, 6 and 7, 2016. 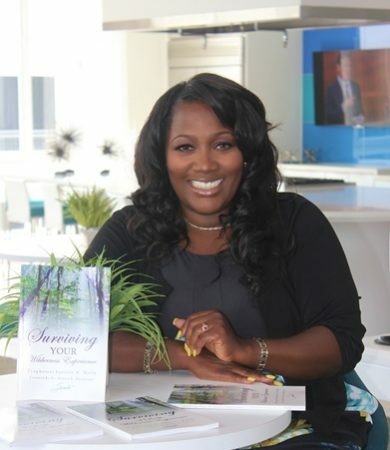 This life-changing event, staged in the tropical oasis of Coconut Grove, FL, will be stacked with keynote speakers, “New You” makeovers, self-esteem sessions, indulgent spa pampering, fashion show, morning workouts, mingle brunches and more. The retreat is geared toward preparing women of all ages to survive their “wilderness experience” and providing them with the tools to living a stress-free and virtuous life, while walking in God’s divine purpose and plan. Confirmed speakers are Janice Johnson, Jadine Louissaint, Stacey-Ann Musgrove, Prophetess Suzette A. Kelly, Carol Green-Vonkaul, Mark Howard-CPA,Vanessa Cañas, Iris Gonzalez, Pastor/Prophetess Deserine Leslie, Ruth Tuffet, Kendrick Ramhings, Njie Sabik-Actress, Dr. Simone Alia D.D. H.C, Linda Scott and La-La. The event will take place over for three nights and four days at various venues within a 5 mile radius of Coconut Grove at The Sonesta Coconut Grove, The Mayfair Hotel & Spa and The Palmeiras. Shuttle service will be provided to the venues. The evening sessions will be free to the public with the daily sessions being exclusively for registered retreat attendees only. Opening night will kick off at Miami Marlins Ball Park where 3,000 women will be invited to hear Pastor Paula White speaking on living their destiny. The daily and evening sessions will focus upon intimate topics such as The Woman and Her Business, Life Coaching, Single Moms, Wealth Management, God’s Desire and more. For the complete schedule to "Proverbs 31 Women’s Retreat" or to purchase tickets, please visit http://prophetesssuzetteakelly.com. About Prophetess Suzette A. Kelly: Daughter, sister, mother, entrepreneur, designer and author. Prophetess Suzette A. Kelly was born into an Evangelistic household. She grew up a “preacher’s kid,” but did not want to answer her true calling. So, Suzette stayed away from the church. However, in 2002 after numerous experiences with God, she eventually stopped running from her calling. When God called Suzette with fear, her journey was set. Suzette accepted the calling to the office of the prophetic in December 2004 and sat under other ministries to gain the knowledge God wanted her to learn from 2004 to 2008. Prophetess Kelly learned from ministries such as the Potter’s Vessel Ministry and Dr. Cindy Trimm Ministry. To register for the event or purchase a copy of Surviving Your Wilderness Experience, please visit the website.